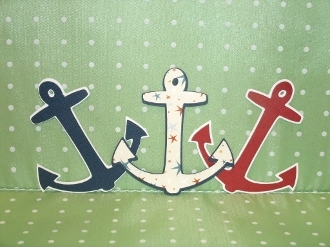 Handmade set of Anchors Scrapbook Embellishment. You get a pack of 3 anchors, each one is 2.5 inches tall. You get one anchor in each of the following colors: Multi-star with Navy shadow, Red with white shadow, and navy with white shadow. All of our papers and card-stock are Acid-free and Lignin free to protect your memories for years to come. All of our embellishments are available in your color choice by Special Order. It is your memory, make it what you want.